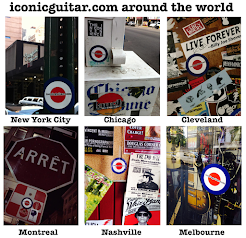 iconic guitar.com: Keith Richards - Ampeg Dan Armstrong "Plexi"
Keith Richards - Ampeg Dan Armstrong "Plexi"
In 1968 the Ampeg Company hired Dan Armstrong as a consultant. He designed a new line of guitars and basses that were constructed of clear plexiglass. The Dan Armstrong line of guitars also became renowned for their excellent electronics, and interchangeable pickups designed by Bill Lawrence, who shared a Greenwich Village shop with Armstrong. The guitars had great sustain due to the solid plexiglass body, but were also quite heavy, weighing in at around ten pounds. Keith Richards acquired one of the guitars for The Rolling Stones 1969 American tour, which was used notably on "Sympathy For The Devil". This guitar was subsequently stolen in France during the recording of "Exile On Main Street". 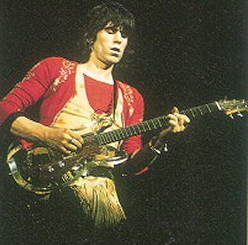 Keith played a reissue model on the 2007 Stones tour.